Even if you weren’t there in the San Diego Comic-Con hall where it was first announced that Voltron: Legendary Defender’s Shiro is a gay man whose relationship would be explored in the show’s seventh season, fans made sure the world knew. For many, the announcement was a significant moment of validation for a sizeable portion of Voltron’s fandom that’s been advocating for queer representation on the show. Rather than delving into a plot about two of Voltron’s Paladins falling in love with one another the way some hoped, the series introduces Adam, Shiro’s long-term partner who lives back on Earth. In the days leading up to the season premiere, there was an understandable excitement within the fandom, given that Netflix and Dreamworks were rather tight-lipped about the upcoming character arcs. Finally, people had the chance to dive back into the show, and as everyone eventually finished the season, there were questions and confusion. 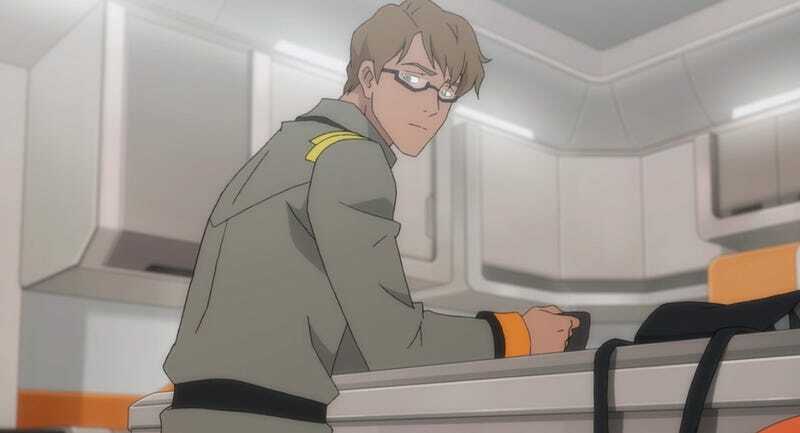 I recently spoke with Voltron’s co-showrunners Joaquim Dos Santos and Lauren Montgomery about how the show approaches Adam and Shiro’s relationship, and they explained how they really want the fans to understand the story they’re trying to tell. In the season’s first episode, “A Little Adventure,” there are flashbacks to Keith and Shiro’s pasts on Earth, where we meet Adam and learn more about the degenerative disease threatening Shiro’s life. 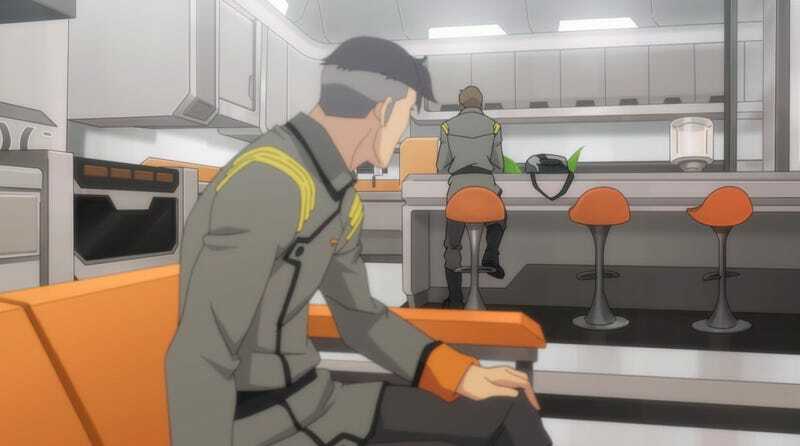 Though Shiro’s a first-rate pilot and the logical pick to join the upcoming Kerberos mission, his disease would progress much too far in the three years it would take for him to make it to his destination. Shiro, ever the soldier, is willing to make that sacrifice. That decision is something that devastates Adam when Shiro breaks the news to him. Even though the pair are never explicitly referred to as being romantically involved, the fight they have over Shiro’s deployment definitely reads like a fight between two men who once loved each other, but have grown apart after countless similar fights. Adam gives Shiro the classic “if you go, don’t expect me to be here when you get back” ultimatum, and by this point, it’s clear what choice Shiro made. Adam doesn’t appear again until episode 8, “The Last Stand Part 2,” where he and a number of other Garrison attempt to hold back the Galra invasion with a fleet of outclassed fighter jets. Though the pilots put up a good fight, they’re all quickly outmatched and murdered and that’s the last we see of Adam. “From a character perspective, I think we really wanted to get across that Shiro is somebody who was dealing with complex, interpersonal relationships before he even became a paladin of Voltron. “Having them at that point in their relationship was easier for us from a storytelling standpoint because it let us free Shiro up from that particular kind of plot line. It isn’t difficult to understand where everyone’s impassioned feelings about Voltron’s queer representation come from. In a very literal sense, the show unceremoniously buries one of its only two queer characters the very same season he’s introduced, and you wouldn’t even know that he was queer simply from watching the show by itself. That being said, queer representation comes in many different forms, some of which are none too heartwarming. Voltron cast member Bex Taylor-Klaus took to their Twitter feed soon after fans began expressing anger about the show with a reminder that the season is, at its core, a story about war. It’s not queerbaiting, @jarjarstiddies — it’s just not the queer content you wanted. Relationships sometimes end in loss, and those queer stories are worth exploring as well. The problem, of course, is that queer representation on screen continues to be so woefully lacking that plots like Voltron’s feel like a slap in the face. It’s a matter of personal opinion whether you see Voltron’s seventh season as problematic. Regardless of which side of the issue you fall on, though, there’s something to be said for the fact that the conversation around the show now has moved into a new space. Imperfect as it may be, Voltron’s made its first step in the right direction. Hopefully, the creative team behind the show has taken the fandom’s reaction to heart and plans to try and do this better next time around.